From paper-based CAD drawings to bar charts in spreadsheets, two-dimensional (2-D) visualization has been a staple of businesses for decades. But technical information and processes are becoming increasingly complex. 3-D visualization can provide a richer, more detailed view of complex data, technical drawings, and processes than its 2-D counterpart. A common problem with making 3-D data ...universally accessible is moving that data outside of engineering departments and the tools that those departments use. Engineering departments typically have the knowledge, expertise, and access to complex CAD tools to create and manipulate 3-D content. 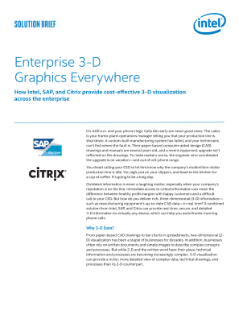 Intel, SAP, and Citrix can help enterprises realize the benefits of moving 3-D data out of engineering by giving nontechnical users access to complex, interactive animations and models. Get the benefits of both a tablet and PC with enterprise-level flexibility, performance, security.